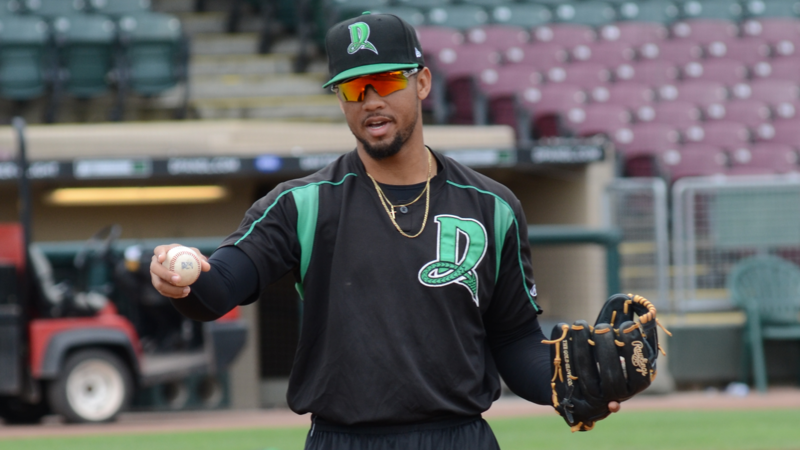 Dayton, Ohio-Dayton Dragons infielder Leandro Santana has been selected as the Cincinnati Reds 2018 Minor League Community Service award winner. The Reds announced their Minor League player awards at RedsFest. Santana spent the entire 2018 season with the Dragons. He was selected for the award based on his efforts in Dayton this season as a volunteer as part of various Dragons community service endeavors. Santana became the seventh Dragons player to win the Reds Minor League Community Service Award since 2011. The award is given to only one player each year across all levels of the Reds farm system. Previous Dragons winners of the Reds Community Service Award were Drew Hayes (2011), El'Hajj Muhammad (2012), Brent Peterson (2013), Jon Matthews (2014), Avain Rachal (2015), and Aaron Fossas (2017). Also at RedsFest, the Reds named the following Minor League player awards: Sheldon "Chief" Bender Minor League Player of the Year: Ibandel Isabel; Minor League Hitter of the Year: T.J. Friedl; Minor League Pitcher of the Year: Tony Santillan. Friedl and Santillan are both former Dragons. Friedl spent the first half of the 2017 season with the Dragons, while Santillan spent all of 2017 in Dayton after briefly pitching for the Dragons in 2016. The Reds Minor League Player of the Year award is named after Sheldon "Chief" Bender, who worked in professional baseball for 64 years, 39 of those with the Reds. Bender oversaw the Reds farm system from 1967-'88, producing stars such as Ken Griffey Sr., Dave Concepcion, Ron Oester, Mario Soto, Eric Davis, Barry Larkin, Chris Sabo, Paul O'Neill, and countless others. Bender passed away in 2008 at the age of 88.